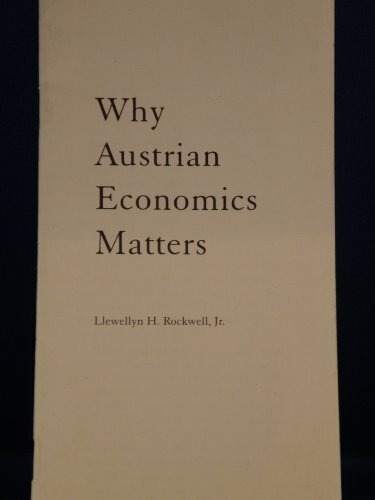 This speech by Lew Rockwell was delivered at the Heritage Foundation, and even at the time was regarded as the best single overview of the teachings of the Austrian school, its contribution to the history of ideas, and the political implications of Austrian economic theory. Economics, wrote Joseph Schumpeter, is “a big omnibus which contains many passengers of incommensurable interests and abilities.” That is, economists are an incoherent and ineffectual lot, and their reputation reflects it. Yet it need not be so, for the economist attempts to answer the most profound question regarding the material world. Pretend you know nothing about the market, and ask yourself this question: how can society’s entire deposit of scarce physical and intellectual resources be assembled so as to minimize cost; make use of the talents of every individual; provide for the needs and tastes of every consumer; encourage technical innovation, creativity, and social development; and do all this in a way that can be sustained? This question is worthy of scholarly effort, and those who struggle with the answer are surely deserving of respect. The trouble is this: the methods used by much of mainstream economists have little to do with acting people, and so these methods do not yield conclusions that have the ring of truth. This does not have to be the case. The central questions of economics have concerned the greatest thinkers since ancient Greece. And today, economic thinking is broken into many schools of thought: the Keynesians, the Post Keynesians, the New-Keynesians, the Classicals, the New Classicals (or Rational Expectations School), the Monetarists, the Chicago Public Choicers, the Virginia Public Choicers, the Experimentalists, the Game Theorists, the varying branches of Supply Sideism, and on and on it goes. Also part of this mix, but in many ways apart from and above it, is the Austrian School. It is not a field within economics, but an alternative way of looking at the entire science. Whereas other schools rely primarily on idealized mathematical models of the economy, and suggest ways the government can make the world conform, Austrian theory is more realistic and thus more socially scientific. Austrians view economics as a tool for understanding how people both cooperate and compete in the process of meeting needs, allocating resources, and discovering ways of building a prosperous social order. Austrians view entrepreneurship as a critical force in economic development, private property as essential to an efficient use of resources, and government intervention in the market process as always and everywhere destructive. The Austrian School is in a major upswing today. In academia, this is due to a backlash against mathematization, the resurgence of verbal logic as a methodological tool, and the search for a theoretically stable tradition in the madhouse of macroeconomic theorizing. In terms of policy, the Austrian School looks more and more attractive, given continuing business-cycle mysteries, the collapse of socialism, the cost and failure of the welfare warfare regulatory state, and public frustration with big government. In its twelve decades, the Austrian School has experienced different levels of prominence. It was central to the price theory debates before the turn of the century, to monetary economics in the first decade of the century, and to the controversy over socialism’s feasibility and the source of the business cycle in the 1920s and 1930s. The school fell into the background from the 1940s to the mid-1970s, and was usually mentioned only in history of economic thought texts. Menger also generated a new theory of money as a market institution, and grounded economics in deductive laws discoverable by the methods of the social sciences. Menger’s book, said Ludwig von Mises, made an economist of him, and it is still of great value. Eugen von Böhm-Bawerk was the next important figure in the Austrian School. He showed that interest rates, when not manipulated by a central bank, are determined by the time horizons of the public, and that the rate of return on investment tends to equal the rate of time preference. He also dealt a deadly blow to Marx’s theory of capital and exploitation, and was a key defender of theoretical economics at a time when historicists of every stripe were trying to destroy it. Böhm-Bawerk’s greatest student was Ludwig von Mises, whose first major project was the development of a new theory of money. The Theory of Money and Credit, published in 1912, elaborated on Menger, showing not only that money had its origin in the market, but that there was no other way it could have come about. Mises also argued that money and banking ought to be left to the market, and that government intervention can only cause harm. In that book, which remains a standard work today, Mises also sowed the seeds of his business-cycle theory. He argued that when the central bank artificially lowers interest rates, it causes distortions in the capital-goods sector of the structure of production. When malinvestments occur, an economic downturn is necessary to wash out bad investments. Along with his student F. A. Hayek, Mises established the Austrian Institute for Business Cycle Research in Vienna, and he and Hayek showed that the central bank is the source of the business cycle. Their work eventually proved to be most effective in combating Keynesian experiments in fine-tuning the economy through fiscal policies and the central bank. The Mises-Hayek theory was dominant in Europe until Keynes won the day by arguing that the market itself is responsible for the business cycle. It didn’t hurt that Keynes’s theory advocating more spending, inflation, and deficits was already being practiced by governments around the world. At the time of the business-cycle debate, Mises and Hayek were also involved in a controversy over socialism. In 1920, Mises had written one of the most important articles of the century: “Economic Calculation in the Socialist Commonwealth,” followed by his book, Socialism. Until then, there had been many critiques of socialism, but none had challenged socialists to explain how their economy would actually work absent free prices and private property. Mises argued that rational economic calculation requires a profit-and-loss test. If a firm makes a profit, it is using resources efficiently; if it makes a loss, it is not. Without such signals, the economic actor has no way to test the appropriateness of his decisions. He cannot assess the opportunity costs of this or that production decision. Prices and the profit-and-loss corollary are essential. Mises also showed that private property in the means of production is necessary for these prices to be generated. Socialism holds that the means of production should be in collective hands. This means no buying or selling of capital goods and thus no prices for them. Without prices, there is no profit and loss test. Without accounting for profit and loss, there can be no real economy. Should a new factory be built? Under socialism, there is no way to tell. Everything becomes guesswork. Mises’s essay ignited a debate all over Europe and America. One top socialist, Oskar Lange, conceded that prices are necessary for economic calculation, but he said that central planners could generate prices out of their own heads, watch the length of lines at stores to determine consumer demand, or provide the signals of production themselves. Mises countered that “playing market” wouldn’t work either; socialism, by its own internal contradictions, had to fail. Hayek used the occasion of the calculation debate to elaborate upon and broaden the Misesian argument into his own theory of the uses of knowledge in society. He argued that the knowledge generated by the market process was inaccessible to any single human mind, especially that of the central planner. The millions of decisions required for a prosperous economy are too complex for any one person to comprehend. This theory became the basis of a fuller theory of the social order that occupied Hayek for the rest of his academic life. Mises came to the U.S. after fleeing the Nazis and was taken in by a handful of free-market businessmen, preeminently Lawrence Fertig. Here he helped build a movement around his ideas, and most free-market economists acknowledge their debt to him. No one, as Milton Friedman has said, did as much as Mises to promote free markets in this country. But those were dark times. He had trouble finding the paid university post he deserved, and it was difficult to get a wider audience for his views. During these early years in America, Mises worked to rewrite his just completed German-language treatise into Human Action, an all-encompassing work for English-language audiences. In it, he carefully reworked the philosophical grounding of the social sciences in general and economics in particular. This proved to be a significant contribution: long after the naive dogmas of empiricism have failed, Mises’s “praxeology,” or logic of human action, continues to inspire students and scholars. This magnum opus swept aside Keynesian fallacies and historicist pretensions and ultimately made possible the revival of the Austrian School. Until the 1970s, however, it was hard to find a prominent economist who did not share the Keynesian tenets: that the price system was perverse, that the free market was irrational, that the stock market was driven by animal spirits, that the private sector could not be trusted, that government was capable of planning the economy to keep it from falling into recession, and that inflation and unemployment were inversely related. One exception was Murray N. Rothbard, another great student of Mises’s, who wrote a massive economic treatise in the early 1960s called Man, Economy, and State. In his book, Rothbard added his own contributions to Austrian thought. Similarly, the work of two other important students of Mises, Hans F. Sennholz and Israel Kirzner, carried on the tradition. And Henry Hazlitt, then writing a weekly column for Newsweek, did as much as anybody to promote the Austrian School, and made contributions to the school himself. The stagflation of the 1970s undermined the Keynesian School by showing that it was possible to have both high inflation and high unemployment at the same time. The Nobel Prize that Hayek received in 1974 for his business-cycle research with Mises caused an explosion of academic interest in the Austrian School and free-market economics in general. A generation of graduate students began studying the work of Mises and Hayek, and that research program continues to grow. Today, the Austrian School is most fully embodied in the work of the Mises Institute. The concepts of scarcity and choice lie at the heart of Austrian economics. Man is constantly faced with a wide array of choices. Every action implies forgone alternatives or costs. And every action, by definition, is designed to improve the actor’s lot from his point of view. Moreover, every actor in the economy has a different set of values and preferences, different needs and desires, and different time schedules for the goals he intends to reach. The needs, tastes, desires, and time schedules of different people cannot be added to or subtracted from other people’s. It is not possible to collapse tastes or time schedules onto one curve and call it consumer preference. Why? Because economic value is subjective to the individual. Similarly, it is not possible to collapse the complexity of market arrangements into enormous aggregates. We cannot, for example, say the economy’s capital stock is one big blob summarized by the letter K and put that into an equation and expect it to yield useful information. The capital stock is heterogeneous. Some capital may be intended to create goods for sale tomorrow and others for sale in ten years. The time schedules for capital use are as varied as the capital stock itself. Austrian theory sees competition as a process of discovering new and better ways to organize resources, one that is fraught with errors but that is constantly being improved. This way of looking at the market is markedly different from every other school of thought. Since Keynes, economists have developed the habit of constructing parallel universes having nothing to do with the real world. In these universes, capital is homogeneous and competition is a static end state. There are the right number of sellers, prices reflect the costs of production, and there are no excess profits. Economic welfare is determined by adding up the utilities of all individuals in society. The passing of time is rarely accounted for, except in changing from one static state to another. Varying time schedules of producers and consumers are simply nonexistent. Instead we have aggregates that give us precious little information at all. A conventional economist is quick to agree that these models are unrealistic, ideal types to be used as mere tools of analysis. But this is disingenuous, since these same economists use these models for policy recommendations. One obvious example of basing policy on contrived models of the economy takes place at the Justice Department’s antitrust division. There the bureaucrats pretend to know the proper structure of industry, what kind of mergers and acquisitions harm the economy, who has too much market share or too little, and what the relevant market is. This represents what Hayek called the pretense of knowledge. The correct relationship between competitors can only be worked out through buying and selling, not bureaucratic fiat. Austrian economists, in particular Rothbard, argue that the only real monopolies are created by government. Markets are too competitive to allow any monopolies to be sustained. Another example is the idea that economic growth can be manufactured by manipulating aggregate demand curves through more and faster government spending considered to be a demand booster instead of a supply reducer or government bullying of the consuming public. If the hallmark of conventional economics is unrealistic models, the hallmark of Austrian economics is a profound appreciation of the price system. Prices provide economic actors with critical information about the relative scarcity of goods and services. It is not necessary for consumers to know, for example, that a disease has swept the chicken population to know that they should economize on eggs. The price system, by making eggs more expensive, informs the public of the appropriate behavior. The price system tells producers when to enter and leave markets by relaying information about consumer preferences. And it tells producers the most efficient that is, the least costly way to assemble other resources to create goods. Apart from the price system, there is no way to know these things. But prices must be generated by the free market. They cannot be made up the way the Government Printing Office makes up the prices for its publications. They cannot be based on the costs of production in the manner of the Post Office. Those practices create distortions and inefficiencies. Rather, prices must grow out of the free actions of individuals in a juridical setting that respects private property. Neoclassical price theory, as found in most graduate texts, covers much of this territory. But typically, it takes for granted the accuracy of prices apart from their foundation in private property. As a result, virtually every plan for reforming the post-socialist economies talked about the need for better management, loans from the West, new and different forms of regulation, and the removal of price controls, but not private property. The result was the economic equivalent of a train wreck. Free-floating prices simply cannot do their work apart from private property and concomitant freedom to contract. Austrian theory sees private property as the first principle of a sound economy. Economists in general neglect the subject, and when they mention it, it is to find a philosophical basis for its violation. The logic and legitimacy of “market failure” analysis, and its public-goods corollary, is widely accepted by non-Austrian schools of thought. The notion of public goods is that they cannot be supplied by the market, and instead must be supplied by government and funded through its taxing power. The classic case is the lighthouse, except that, as Ronald Coase has shown, private lighthouses have existed for centuries. Some definitions of public goods can be so broad that, if you throw out common sense, everyday consumer goods qualify. Austrians point out that it is impossible to know whether or not the market is failing without an independent test, of which there is none outside the actions of individuals. The market itself is the only available criterion for determining how resources ought to be used. Let’s say I deem it necessary, for various social reasons, that there be one barber for every 100 people and, as I look around, I notice that this is not the case. Thus I might advocate that a National Endowment for Barbers be established to increase the barber supply. But the only means for knowing how many barbers there ought to be is the market itself. If there are fewer than one per hundred, we must assume that a larger number is not supposed to exist by any reasonable standard of efficient markets. It is not economically proper to develop a wish list of jobs and institutions that stands apart from the market itself. Conventional economics teaches that if the benefits or costs of one person’s economic decisions spill over onto others, an externality exists, and it ought to be corrected by the government through redistribution. But, broadly defined, externalities are inherent in every economic transaction because costs and benefits are ultimately subjective. I may be delighted to see factories belching smoke because I love industry. But that does not mean I should be taxed for the privilege of viewing them. Similarly, I may be offended that most men don’t have beards, but that doesn’t mean that the clean-shaven ought to be taxed to compensate me for my displeasure. The Austrian School redefines externalities as occurring only with physical invasions of property, as when my neighbor dumps his trash in my yard. Then the issue becomes crime. There can be no value-free adding-up of utilities to determine subjective costs or benefits of economic activity. Instead, the relevant criterion should be whether economic actions occur in a peaceful manner. Another area where Austrians differ is how the government is supposed to go about the practical problem of correcting for market failures. Grant that somehow the government can spot a market failure, the burden of proof is still on the government to demonstrate that it can perform the task more efficiently than the market. Austrians would refocus the energy that goes into finding market failures to understanding more about government failures. But the failure of government to do what mainstream theory says it can is not a popular subject. Outside of the Public Choice schools, it is usually assumed that the government is capable of doing anything it wants to do, and of doing it well. Forgotten is the nature of the state as an institution with its own pernicious designs on society. One of the contributions of Rothbard was to focus Austrians on this point, and on the likely patterns interventions will take. He developed a typology of interventionism, and provided detailed critiques of many kinds of interventions and their consequences. The question is often asked, in James Buchanan’s famous phrase, What Should Economists Do? Mainstreamers answer, in part: forecast the future. This goal is legitimate in the natural sciences, because rocks and sound waves do not make choices. But economics is a social science dealing with people who make choices, respond to incentives, change their minds, and even act irrationally. Austrian economists realize that the future is always uncertain, not radically so, but largely. Human action in an uncertain world with pervasive scarcity poses the economic problem in the first place. We need entrepreneurs and prices to help overcome uncertainty, although this can never be done completely. Forecasting the future is the job of entrepreneurs, not economists. This is not to say that Austrian economists cannot expect certain consequences of particular government policies. For example, they know that price ceilings always and everywhere create shortages, and that expansions of the money supply lead to general price increases and the business cycle, even if they cannot know the time and exact nature of these expected events. One final area of theoretical concern that distinguishes Austrians from the mainstream is economic statistics. Austrians are critical of the substance of most existing statistical measures of the economy. They are also critical of the uses to which they are put. Take, for example, the question of price elasticities, which supposedly measure consumer responsiveness to changes in price. The problem lies in the metaphor and its applications. It suggests that elasticities exist independent of human action, and that they can be known in advance of experience. But measures of historical consumer behavior do not constitute economic theory. Another example of a questionable statistical technique is the index number, the prime means by which the government calculates inflation. The problem with index numbers is that they obscure relative price changes between goods and industries, and relative price changes are of prime importance. This is not to say the Consumer Price Index is irrelevant, only that it is not a solid indicator, is subject to wide abuse, and masks highly complex price movements between sectors. And the Gross Domestic Product statistic is riddled with composition fallacies inherent in the Keynesian model. Government spending is considered part of aggregate demand, and no effort is made to account for the destructive costs of taxation, regulation, and redistribution. If Austrians had their way, the government would never collect another economic statistic. Such data is used primarily to plan the economy. For Austrians, economic regulation is always destructive of prosperity because it misallocates resources and is extremely destructive of small business and entrepreneurship. Environmental regulation has been among the worst offenders in recent years. Nobody can calculate the extraordinary losses associated with the Clean Air Act or the absurdities associated with wetlands or endangered species policies. However, environmental policy can do what it is explicitly intended to do: lower standards of living. But antitrust policy, in contrast to its stated policy, does not generate competitiveness. Such bogeymen as predatory pricing still scare the bureaucrats at Justice, whereas simple economic analysis can refute the idea that a competitor can sell below his cost of production to take over the market and then sell at monopoly prices later. Any firm that attempts to sell below the costs of production will indefinitely suffer loses. The moment it attempts to raise prices, it invites competitors back into the market. Civil rights legislation represents one of the most intrusive regulatory interventions in labor markets. When employers are not able to hire, fire, and promote based on their own criteria of merit, dislocations occur within the firm and in labor markets at large. Moreover, civil rights legislation, by creating legal preferences for some groups, undermines the public sense of fairness that is the market’s hallmark. There is another cost of economic regulation: it impedes the entrepreneurial discovery process. This process is based on having a wide array of alternatives open to the use of capital. Yet government regulation limits the options of entrepreneurs, and erects barriers to the exercise of entrepreneurial talent. Safety, health, and labor regulations, for example, not only inhibit existing production, they impede the development of better production methods. Austrians have also developed impressive critiques of redistributionism. Conventional welfare theory argues that if the law of diminishing marginal utility is true, then total utility can be easily increased. If you take a dollar from a rich man, his welfare is slightly diminished, but that dollar is worth less to him than to a poor man. Thus redistributing a dollar from a rich man to a poor man increases the total utility between the two. The implication is that welfare can be maximized through perfect income equality. The problem with this, say Austrians, is that utilities cannot be added and subtracted, since they are subjective. Redistributionism takes from property-owners and producers and gives, by definition, to non-owners and non-producers. This diminishes the value of the property that has been redistributed. Far from increasing total welfare, redistributionism diminishes it. By making property and its value less secure, income transfers lessen the benefits of ownership and production, and thus lower the incentives to both. Austrians reject the use of redistribution to stimulate the economy or otherwise manipulate the structure of economic activity. Increasing taxes, for example, can do nothing but harm. A shorthand for taxes is wealth destruction. They forcibly confiscate property that could otherwise be saved or invested, thus lowering the number of consumer options available. Moreover, there is no such thing as a strict consumer tax. All taxes decrease production. Austrians do not go along with the view that deficits don’t matter. In fact, the requirement that deficits be financed by the public or foreign bond holders drives up interest rates and thus crowds out potential private investment. Deficits also create the danger that they will be financed through central-bank inflation. Yet the answer to deficits is not to increase taxation, which is more destructive than deficits, but rather to balance the budget through necessary spending cuts. Where to cut? Anywhere and everywhere. The ideal situation is not simply a balanced budget. Government spending itself, regardless of deficit or surplus, should be as small as possible. Why? Because such spending diverts resources from better uses in private markets. We hear talk of this or that “government investment.” Austrians reject this term as an oxymoron. Real investment is taken on by capitalists risking their own money in hopes of satisfying future consumer demands. Government limits the satisfaction of consumer demands by hampering production in the private sector. Besides, government investments are notorious wastes of money, and are in fact consumption spending by politicians and bureaucrats. Mainstream economists hold that the government must control monetary policy and the structure of banking through cartels, deposit insurance, and a flexible fiat currency. Austrians reject this entire paradigm, and argue that all are better controlled through private markets. In fact, to the extent that today we have serious and radical proposals for having the market play a greater role in banking and monetary policy, it is due to the Austrian School. Deposit insurance has been on the public mind since the collapse of the S&L industry. The government guarantees deposits and loans with taxpayer money, and that makes financial institutions less careful. Government effectively does to financial institutions what a permissive parent does to a child: encourages poor behavior by eliminating the threat of punishment. Austrians would eliminate deposit insurance, and not only allow bank runs to occur, but appreciate their potential as a necessary check. There would be no lender of last resort that is, the taxpayer in an Austrian monetary regime, to bail out bankrupt and illiquid institutions. Much of the Austrian critique of central banking centers around the Mises-Hayek business cycle theory. Both argued that the central bank, and not the market itself, is responsible for the cyclical behavior of business activity. To demonstrate the theory, Austrians have undertaken extensive studies of many historical periods of recession and recovery to show that each was preceded by central-bank machinations. The theory argues that central-bank efforts to lower interest rates below their natural level causes borrowers in the capital goods industry to overinvest in their projects. A lower interest rate is normally a signal that consumers’ savings are available to back up new production. That is, if a producer borrows to build a new building, there is enough savings for consumers to buy the goods and services that will be made in the building. Projects undertaken can be sustained. But artificially lowered interest rates lead businesses into undertaking unnecessary projects. This creates an artificial boom followed by a bust once it is clear that savings weren’t high enough to justify the degree of expansion. Austrians point out that the Monetarist growth rule ignores the “injection effects” of even the smallest increase in money and credit. Such an increase will always create this business-cycle phenomenon, even if it works to maintain a relatively stable index number, as in the 1920s and 1980s. What then should policy makers do when the economy enters recession? Mostly, nothing. It takes time to wipe out the malinvestment created by the credit boom. Projects that were undertaken have to go bankrupt, employees mistakenly hired must lose their jobs, and wages must fall. After the economy is cleansed of the bad investments induced by the central bank, growth can begin anew, based on a realistic assessment of the future behavior of consumers. If the government wants to make the recovery process work faster if, say, there is an election coming up there are some things it can do. It can cut taxes, putting more wealth into private hands to fuel the recovery process. It can eliminate regulations, which inhibit private-sector growth. It can cut spending and reduce the demand on credit markets. It can repeal anti-dumping laws, and cut tariffs and quotas, to allow consumers to buy imported goods at cheaper prices. Central banking also creates incentives toward inflationary monetary policies. It is not a coincidence that since the creation of the Federal Reserve System, the value of the dollar has declined 98%. The market did not make this happen. The culprit is the central bank, whose institutional logic drives it toward an inflationary policy just as a counterfeiter is driven to keep his printing press running. Austrians would reform this in fundamental ways. Misesians advocate a return to a 100% gold coin standard, an end to fractional-reserve commercial banking, and the abolition of the central bank, while Hayekians advocate a system where consumers select currencies from a variety of alternatives. Today, Austrian economics is on the upswing. Mises’s works are read and discussed all over Western and Eastern Europe and the former Soviet Union, as well as Latin America and North Asia. But the new interest in America, where the insights of the Austrian School are even more sorely needed, is especially encouraging. The success of the Ludwig von Mises Institute is testimony to this new interest. The primary purpose of the Institute is to ensure that the Austrian School is a major force in the economic debate. To this end, we have cultivated and organized hundreds of professional economists, provided scholarly and popular outlets for their work, educated thousands of graduate students in Austrian theory, distributed millions of publications, and formed intellectual communities, most notably at Auburn University and the University of Nevada, Las Vegas, where these ideas thrive. Every year we hold a summer instructional seminar on the Austrian School called the Mises University, with a faculty of more than 25, and top-flight students from around the country. We also hold academic conferences on theoretical and historical subjects, and the Institute’s scholars are frequent participants at major professional meetings. Transaction Publishers co-sponsors the Institute’s scholarly Quarterly Journal of Austrian Economics, the only quarterly journal in the English-speaking world devoted exclusively to the Austrian School. Transaction also publishes some of our books. The Austrian Economics Newsletter is written and edited by and for Austrian School graduate students. The Free Market applies Austrian ideas to issues of government policy. The Mises Institute assists students and faculty at hundreds of colleges and universities. We have a program for visiting fellows to complete dissertations, and for visiting scholars to pursue new research, as well as our major center for graduate students. At Auburn, the Institute’s Austrian Economics Workshop explores new areas of history, theory, and policy, and the weekly colloquium brings students and faculty together to apply Austrian thought within an interdisciplinary context. New books on the Austrian School appear every few months, and Austrians are writing for all the major scholarly journals. Misesian insights are presented in hundreds of economics classrooms all over the country (whereas just 20 years ago, no more than a dozen classrooms presented them). Austrians are the rising stars in the profession, the economists with the new ideas that attract students, the ones on the cutting edge with a pro-market and anti-statist orientation. Most of these scholars have been cultivated through the Mises Institute’s academic conferences, publications, and teaching programs. With the Institute backing the Austrian School, tradition and constructive radicalism combine to create an attractive and intellectually vibrant alternative to conventional thought. The future of Austrian economics is bright, which bodes well for the future of liberty itself. For if we are to reverse the trends of statism in this century, and reestablish a free market, the intellectual foundation must be the Austrian School. That is why Austrian economics matters.